Deadpool doesn't really need a marketing team as long as Ryan Reynolds has Twitter with the lead in Fox's rated R take on Marvel Comic's favorite Merc with a Mouth sharing quite a lot of images from the movie over the last few weeks. 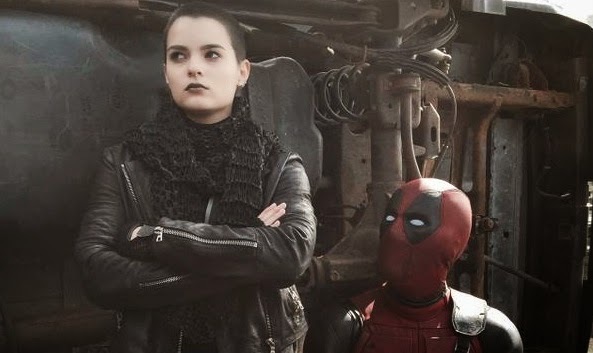 Now, he's back with a set image featuring him in full costume with one of his supporting players Teenage Negasonic Warhead, played by newcomer Brianna Hildebrand. Never really interacting with Deadpool in her short time on the printed page, Teenage Negasonic Warhead (named after the Monster Magnet song) was introduced, and swiftly done away with, in the pages of Grant Morrison's influential New X-Men run. A telepathic mutant with vast precognitive abilities, she was used sparingly since her first appearance, most notably as a psychic illusion in Joss Whedon's time on Astonishing X-Men. With Teenage Negasonic Warhead and Colossus (though Daniel Cudmore will not be in the role he's played since X-Men 2), this makes a solid connection between Deadpool and the rest of the X-Men universe, and also is a smart decision to keep Deadpool's vast and interesting pool (heh) of supporting characters on the back burner for future installments.